Congress general secretary arrived Lucknow on Sunday morning to meet party workers and office-bearers ahead of her election campaign tour from Prayagraj to Varanasi from Monday to Wednesday. LUCKNOW: Newly-appointed general secretary of Congress party and in-charge of eastern UP Priyanka Gandhi Vadra has resolved to change the politics of Uttar Pradesh. 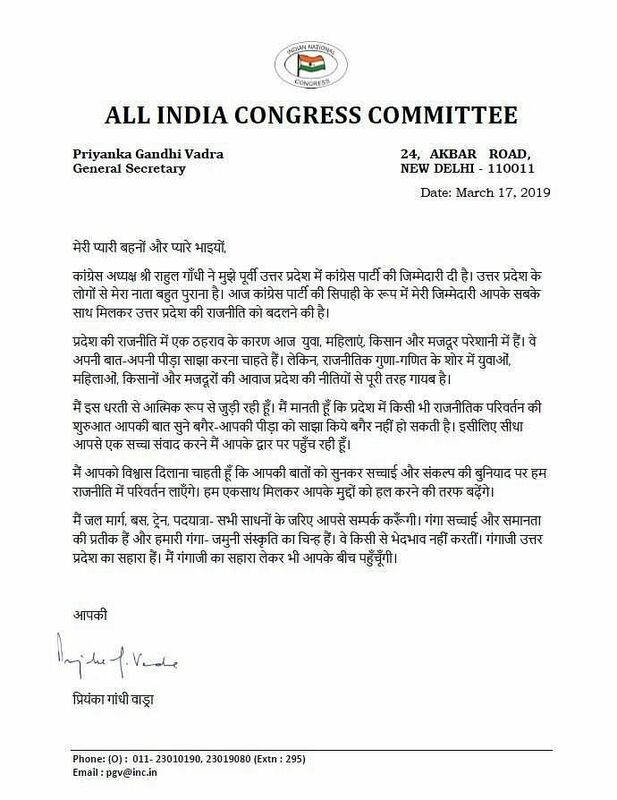 Writing an open letter to the people of country’s most populous and politically crucial state on Sunday, Priyanka called herself Congress'foot soldier who was entrusted with the responsibility to change the face of UP politics with people’s help. "There has been stagnation in politics of Uttar Pradesh owing to which women, youth, labourers and farmers are in distress. They are looking for someone to share their pain and plight but their voice has sunk in the cacophonous arithmetic of cast, community and politics in the state hence they are denied a role in framing the policies for the state," she wrote in the letter released to media. Striking a personal note with people of UP, Priyanka further said that she had been associated with the land for ages. "I firmly believe that no political change can take place without understanding your plight. That is why I am coming to connect and have a direct dialogue with all of you," she said. "I want to assure you that after listening to you, we will together bring about a change in the face of politics based on the foundation of truth and resolve. We will then move together to resolve your issues,” wrote the Congress leader in a bid to strike a dialogue with the electorate ahead of 2019 Lok Sabha elections. Meanwhile, the Congress general secretary arrived Lucknow on Sunday morning to meet party workers and office-bearers ahead of her trail on steamer from Prayagraj to Varanasi from Monday to Wednesday. Her Ganga Yatra on steamer will take off at Chhatnag in Prayagraj on Monday and culminate at Assi Ghat in Varanasi, parliamentary constituency of PM Modi, on Wednesday evening. She will take the steamer ride at various locations from Prayagraj to Varanasi via Mirzapur and Bhadohi. On Monday, Priyanka will visit Manaiya and take a boat ride. She is also expected to have a "boat pe charcha" with students. At around 11 am, she is expected to visit Dumduma where she will hold a meeting with locals. At around 12 noon, Priyanka will visit Sirsa and then to Lakchhagrih at 1 pm. On the same day, the Congress leader will visit Manda and Sitamadhi. Priyanka Gandhi returned to Lucknow a month after she was launched through a road show on February 11 along with her brother and party President Rahul Gandhi and her western UP counterpart Jyotiraditya Scindia.